Wow I need to really kick it up a notch on my posting if I am going to make 200 posts by the end of the year. Ok that being said back to the topic of this post. This past Sunday we had our second Star Wars RPG game take place, and I was please with its outcome. We had a change in a couple players from the previous week, but I excepted that. In fact I except it to continue until we settle into a regular group. When I started my Shadowrun group we went through half a dozen players coming and going before we finally settled down and got a regular group. This kind of thing happens for a number of different reasons. 1. Personalities - This is a very big thing when it comes to putting a group together. When people RPG, some (not all) tend to play the kind of character/person they wish they could play in real life. This tends to be jerk like characters who really dont work well in a group settings. I am not sure why this happens but it makes the whole group dynamic very hard. For example when we first started playing Shadowrun we had a player who came out for maybe a half dozen games. He had two characters that he played in those six games. The first was an anti social character who lived in a school bus. One day during a game two other players went over to the school bus to wake up this personas character. If they didn't do this the player would be left out of the game. When they got there the player attacked them. When I asked why he was doing that he said "because they woke me up". As you can imagine this did not go over very well, and eventually he left the group and never came back. Getting a good group together can sometimes take a little bit of work and sometimes people just dont mesh. 2. GM Style - Every Game Master has a different style. Some GM do everything they can to kill their players. Some enjoy a lot of combat, some like puzzles, stories, etc. The list is very long. Just like GM's all have a different style all players have a certain type of GM they are looking for. The way I GM is very story heavy, with some good combat and a few puzzles thrown in here and there. I also expect my players to actually role play their characters. Nothing drives me crazy more then when a player tells me what he says to the player sitting right next to him. I want him to turn to that player and actually have the conversation not have it through me. This style does not work for everyone, and I can appreciate that. Doesn't mean I am going to change the way I GM, but I can sympathies knowing that I am not going to meet the needs of every hopeful player who comes to my table. It just means they need to keep looking till they find that perfect GM. 3. Time - This can be the hardest part of putting a group together. Dealing with time and schedules. I have a lot of players in my group who would love to come out every single week, but cant because of family, work, personal commitments etc. Dealing with time can be a huge hurdle for many players. These are just a few of the reasons putting a good group together can be a process, but I am looking forward to seeing what our group turns out to be in Star Wars after we have done some of the sifting. Stay turned for more details. This afternoon I am going to be running a Star War RPG Game. I have never run a Star Wars game before, but I have been a player in one. I am a little concerned about the outcome of this afternoons game for a few different reasons. 1. To date there are 5 people RSVP for the game, and I have never met one of them. Having new players show up to a game is always a hit or miss experiance. When I started my RPG Group online it took a couple of months to collect enough members and create a solid consistent group that would show up every week. For the most part we play Shadowrun, but recently I tried to encourage other games as well, and it was met with only marginal success. The problem with starting a new game is you have to continue showing up rain or shine, people or no people until you get a solid group of players. Given that I already am GM for Shadowrun, a player in a Serenity RPG, and our weekly WoW meetup is done at my house every week, Im am concerned with how much energy I will have for another game. 2. I have no idea what kind of characters my players are going to play. Why is this important? It makes a big deal when writing the adventure. If all my p[layers are playing Sith then I dont want to write an adventure for Jedi and Vise Verse. 3. From the conversation we have had on our online forum board I dont think any of the players RSVP have ever played Star Wars before. Which means the first few sessions will be a learning game session with a lot of book referencing. All in all I am excited but concerned about how the game will go. More to follow afterward. Several years ago I bought a standard Garmin GPS device to use in my car. At the time I was working for a company that required I practically lived out of my car, so it seemed a good investment. Despite all the ads and opinions that a GPS device is only good for a year (Its true I know of at least 3 people who buy a new GPS device EVERY year. This is due to the fact that the map updates are almost as expensive as the GPS device itself. You can buy a GPS device for a little over 100.00, and map updates are anywhere from 50-100.00.) this GPS device has lasted several years and is continuing to run perfect. I have wanted to buy Terra a new GPS for awhile. She doesn't have one and there have been times that it would have been very helpful to her. As I thought about it I decided to look into the idea of using some software on my Iphone to act as my GPS device and give Terra my old GPS. As I struck out onto the internet reviewing different apps the two that I thought would be the best were Tom Tom and AT&T Navigator. They were the most expensive, both costing a little over 50-60 dollars, they both came from "reputable and established" companies, and supposedly had the most stable operating platforms out there. All of this I found out from the official websites for the app or off the app description page. Imagine my surprise when I started reading the reviews. They were horrible for both systems! Both apps seemed to be riddled with problems. Now I was at a loss because I really didn't know where to look. Anyone who has ever been on the Apple App Store knows there are tons of apps for almost any subject. Trying to go through all of them can be a somewhat daunting task. So to help me I decided opinion of others mattered and I looked at the top 10 most downloaded navigation apps. The number one App was called Motion X and cost .99 cents. I looked at the description and the App was a basic GPS turn by turn navigation software. The software would work for just the .99 cents but if you wanted voice prompts and traffic you needed to pay a 20.00 annual fee. This seemed to good to be true, so I jumped to the reviews. I was stunned when I found that EVERY SINGLE review was a 5 start positive rating! That decided it. I quickly bought the app paid the 20.00 and Terra and I jumped into the car to go out. As we were driving I had my "new" GPS take us to our location and it worked like a charm. Anyone with the Iphone should seriously consider this App! 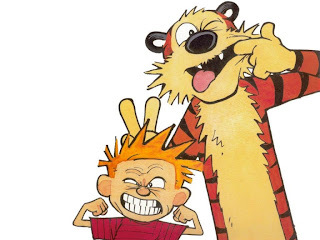 Here is an interview with the creator of Calvin and Hobbs. What a great comic to read. I didn't always feel this way however. When I was young many people said I was a lot like Calvin. I didn't have a lot of friends, I enjoyed boxes, playing in the creek or field, I had a tree house that I had built, I also had put together a VERY shoddy club house on the side of our house one year as well, and at some point in my childhood my parents gave me a stuffed tiger that I named Hobbs. My parents were the ones who introduced me to Calvin and Hobbs, and when I first read the comic I was not a fan. My parents tell the story that I walked into their room one night and said that I didn't understand why they liked Calvin and Hobbs because he was so rude. About 1.2 seconds later my parents were laughing so hard they couldn't even respond. Eventually I came around and grew to love that comic strip. Most afternoons when I was in high school I would come home from school, pour myself a glass of milk, get out the chips and ranch dip and spend maybe 30 minutes snacking while I read Calvin and Hobbs. We had every single book ever put out and after many many years of use they were well read. When Terra and I got married my parents got me the complete collection of Calvin and Hobbs. This has made several friends very jealous, but I am willing to share. Sometimes I like to think of the comic Zits as Calvin all grown up, but even Zits cant replace Calvin and Hobbs. So even though I had to drag myself out of bed this morning and force myself every step of the way into the office, it turned out to be a good day. I got a ton of work done and dont feel as behind the 8 ball as I did yesterday. Terra is in HI right now and I will confess I am VERY jealous! But I am glad she could go and get some sun. At least one of should be able to. I am working on trying to find a way to make it out to the east coast for the KOFL ABM. While I am not actively participating with the KOFL anymore, it would be very nice to get out of the rain and spend a few days with friends. There are a few factors that are making getting out there difficult, but am hopeful I can put something together. I think I just need to get out of the rain. Terra and I talked about going to Rome this year. I am ALL for a trip of some kind. I am hoping we can maybe put something on paper when she gets back. Tonight I am planning on going home and working out, and then watching Burn Notice. With season three back up and running I am enjoying the show once again! So there just a few thought before I head home. As much as Terra and I had concerns about Christmas this year it turned out to be a very nice holiday. I have always enjoyed Christmas. It is my second favorite holiday (Halloween being the first), and come Christmas Eve I always start to feel like a kid again. This year I let my excitement get the better of me and started wanting to open presents on Christmas Eve. Terra was very patient with me and asked that we wait till Christmas. So at 6:00AM I was wide awake and she again very patiently asked me to go back to sleep. Once we got up we passed presents back and forth which was new for me. In my family we have generally just dived in and wrapping paper flew everywhere. It was only AFTER everything was opened that we saw what everyone else got. Even though this was different for me I liked passing gifts back and forth. I was a little disappointed that I couldn't get Terra anything that was a huge surprise. She knew about most of her gifts for one reason or another. This doesn't mean she didn't like what I got her, but I do like surprising her, and I didn't feel I got to do that this year. One funny thing that happened was over breakfast. My family has a tradition that we hang a wreath over the table and hang small but nice gifts from the wreath. I have always liked this tradition and asked if we could continue this tradition in our own home. Terra said we could and when the time came to open the wreath gifts we discovered that neither one of us had picked a good present for the other and both gifts needed to be exchanged. But we both laughed about it and had fun going to the store. Over all Christmas was a good holiday this year and I am looking forward to many more to come.